with a wide choice of colors. What's a Remove Before Flight ? Have you ever wondered why parked planes have long red ribbons with REMOVE BEFORE FLIGHT on it ? At the end of these strips of fabric there is either a small metal tube that slips into the pressure port to obstruct it, or a cover that slips around the hole when it is quite big (ex: "Pitot" tube). Indeed, a lot of parts on an aircraft are vulnerable and need to be properly covered or secured before a long parking time. These red strips, also called red tags, are there to prevent pressure tapping on an aircraft are clogged with dust, insects or any other parasite that would disrupt these air intakes. Indeed, if they are plugged, most flight indicators are no longer operational, especially the anemometer. That's why during takeoff, the first thing to check is that the speed is displayed well! These red tags are used in civil and military aviation. Some of them are attached to pins and are sometimes used to prevent the inadvertent firing of the seat and the embrittlement of the canopy. They are also present to keep the aerodynamic pallets open. These are circuit breakers on the weapon systems (gun, missile, bomb...). Some of these aircraft fly tags are also attached to the landing gear. We can not get in if we forget to remove them. Therefor aircraft manufactures have come up with an easy and reliable solution, cover up what is valuable and attach a huge "REMOVE BEFORE FLIGHT" sign on to the cover or locking pin to make it stand out for the pilot whilst performing his outside check ! Nowadays, these aircraft tags are used as Goodies, in particular in the form of keychains that can be customized for the purpose of promoting a brand or a company. In most cases, you will find the brand name and logo embroidered on the keychain. Small and inexpensive, these keychains have become effective promotional items and widely used by large companies that might give them out by the thousands ! These rates include the standard fastener with eyelet/3cm metal ring + a free artwork. A reinforced fastener can be chosen instead (+ $0.15/unit). Check our gallery to see more keychains designs we've produced for our customers. Customize your Remove Before Flight with your Own Text and Logo. We make every effort to make you as satisfied as possible. 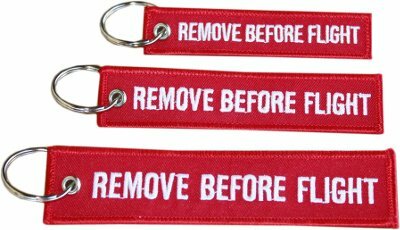 Our know-how and experience make our company the world leader in the marketing of Remove Before Flight keychains. We deliver anywhere in the world and thanks to the expertise of our logistic partners, our shipments are ensured as soon as possible. Remove-before-flight.com is a website of SAS RBF, a retail company.